Is The MRE The Ultimate SHTF Food? Whether you love it or hate it, most preppers have a pretty strong opinion about the MRE. That’s because many of our brave men and women who served in the military likely had these for their meals. However, others have perhaps eaten them while camping or on hiking trips. For those who don’t know MRE stands for Meal Ready to Eat. These were often given to soldiers during lunchtime (whereas in many cases breakfast and dinner were hot meals). The MRE got its name because it’s basically a meal in a bag. 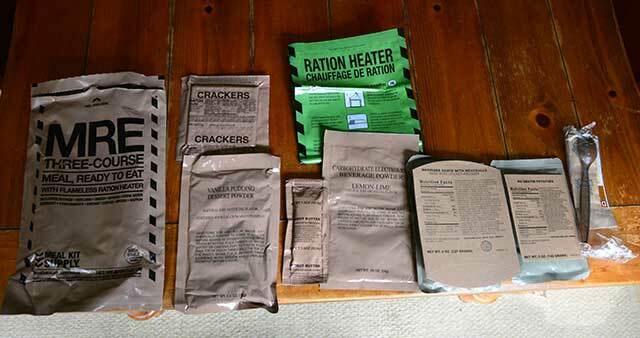 Generally, the MRE contains an entrée, a side dish and a dessert – all in the same bag. These might entail some crackers with peanut butter or cheese, a drink mix, and a beef patty (or ravioli). When the MRE first came out in 1981 things like Skittles and M&M’s weren’t a dessert option. Hot sauce wasn’t an option either – so many soldiers were hard-pressed for ways to flavor this incredibly bland food. And if you were one of the unfortunate soldiers to get the last MRE, you’d be stuck with the meal everyone else had passed over. It’s true – MREs haven’t always been the most delicious meal option. Fortunately, they’ve undergone significant improvements since they first came out. There are now many more meal options to choose from, and the food options are more palatable than they used to be. MREs typically come in boxes of 12 for easy storage. The packaging is also waterproof, which is essential for long-term storage. Plus, since the food packs are made of foil you’re able to heat them on practically anything (on the stove, on a heater vent, on the block of your engine, etc). These are definite benefits. However, it’s very important to check your expectations before tasting an MRE. Many people have certain expectations of what an MRE will look and taste like. And this can be dangerous considering these food packs are built for long-term storage, and are made to tolerate rainstorms and floods (not to mention mistreatment and abuse) and spending years in a warehouse. That’s not to say the food is horrible. But it’s important to keep in mind that a chef has not been preparing these meals – nor do they contain fresh fruits and vegetables. These meals are meant to give you enough calories to keep you alive… and that’s pretty much it. Another thing to keep in mind is that the food in these pouches is intended to get you by – not to thrive. They’re likely not the most nutritious things on the planet – and you’re not going to get all the vitamins, minerals and nutrition you need from these food packs. (Buddies of ours also tell us MREs often cause constipation – which is never welcome in an SHTF situation). Below is a picture of the contents of a typical three-course MRE. Despite the improvements in flavor and number of options, the MRE contents are still basically the same as they were in the 1980’s. For instance, the food still comes in foil packets. However, they now they come with a Ration Heater. The idea is that, when you put a little water in the bag, it mixes with the bag’s contents, causing a chemical reaction and producing heat. In theory, once the bag heats up you wrap the main entrée around the bag and 10 minutes later you have a hot meal. Unfortunately, this doesn’t always go according to plan (and sometimes it flat-out doesn’t work). One nice thing is the MRE does often come with desserts like vanilla pudding. This is not the type you’d buy in the store (since you want it to last for years). However, it comes in powder form – and all you need to do is mix in a little water and shake for about 60 seconds until it’s ready to eat. When an emergency hits, preppers are going to have to rely on the foods they’ve been stockpiling in order to stay alive. These options are typically very low maintenance, and require little-to-no cooking. They also tend to last a long time and are pretty lightweight. Overall, MREs aren’t glamorous – but they do the job. They have a heat pack that (sometimes) works when you need it to, and for the most part the food inside is ready to eat. They aren’t exactly the lightest in weight either, but they’re a lot better than nothing. Another consideration is the taste. Although they’re a lot better than they used to be, they’re no gourmet meal. And when it comes down to it, their purpose is not to taste good – it’s to give you the calories you need to survive. Overall, MREs are a valuable option to consider when preparing your stockpile for a crisis. When it comes down to it, MREs are just ok – they’re better than nothing. But they’re not nearly as filling or flavorful as what you’ll get when you stock up on the super delicious 4 Patriots Survival Food. These 72-hour Survival Food Kits have enough calories, vitamins and nutrition for a solid three days’ worth of survival. That’s because they contain 16 whole servings of mouthwatering meals like Chicken a la King, creamy and hearty Classic Potato Soup, and stick-to-your-ribs breakfast favorite Cinnamon Sugar Oatmeal. Sure, you can settle for an MRE to get your sustenance. But when the world goes to s*** you’ll feel like you’re being pampered with these incredible tasting meals! 4 Patriots Food Kits are made right here in the USA with zero harmful chemicals, GMOs or added MSG. However, that doesn’t sacrifice their shelf life – these survival meals last a whopping 25 years! Sealed inside their specialty “Disaster-Proof” packaging, these survival food kits will be ready and waiting for you when the next crisis comes. (However, you’re going to want to eat them all right away once you try them!). 4 Patriots 72-Hour Survival Food Kits typically retail for about $27. However, we’re so passionate about them that we struck a deal with the manufacturer – and for a limited time you can get these survival food kits FREE. Just pay Shipping and Handling! You deserve to have delicious, nutritious and hearty meals at your disposal when you need them most. Click here to take advantage of this insane survival food deal before SHTF!